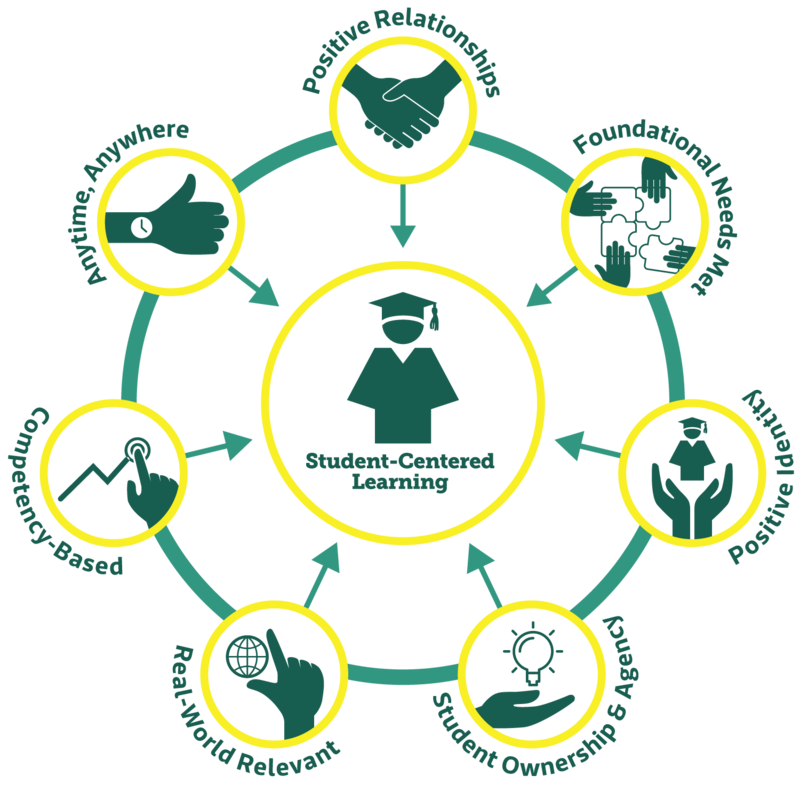 Education Evolving believes that learning must be designed with students at the center. That is, learning must be personalized to students' unique needs, interests, identities, and aspirations—and designed with their ideas and voices at the table. Education Evolving has identified seven common principles of learning that are present when students are at the center of school design decisions. These principles were identified by listening to students and educators, and a careful review of academic research. We assert that when these principles are fully realized the result is learning that is not only equitable, but also designed to meet the unique needs of all students. Students develop strong relationships with other students and with adults who care about them, believe in their potential, and hold them to high expectations. Students are supported in meeting fundamental physical, psychological, and safety needs. Students get help navigating social services, or may receive them directly in a community school environment. Students are fully embraced for who they are, in the context of their communities and cultures, and feel that they belong. They develop a positive sense of their own identities, including elements such as race, ethnicity, gender, and sexual orientation and see those identities reflected at school. Students take responsibility for their learning, exercising choice to pursue their interests and passions, and agency to shape their school environment. Teachers serve increasingly as facilitators and guides. Students solve problems that exist in the real world, learning skills and knowledge in a multidisciplinary context that they will use in their future lives and careers. Students advance by demonstrating mastery of clearly articulated learning objectives, rather than by age, receiving extra support when they struggle and new challenges when they’ve ready to move on. Students have flexibility in when and where they learn within the school, as well as places outside of school (at home, out in community, at local businesses, etc.) and times beyond the typical school day and year. We emphasize that these are general principles of learning and not specific school design characteristics. As an example of the difference, students having more choice and agency is a principle, whereas “project-based learning” is one of many possible design characteristics that educators can use to bring that principle to life. We believe that educators, the experts in teaching and learning, are best suited to implement and customize these principles in collaboration with the individual students and communities they serve. Read more about our theory of change and our initiatives for advancing student-centered learning.